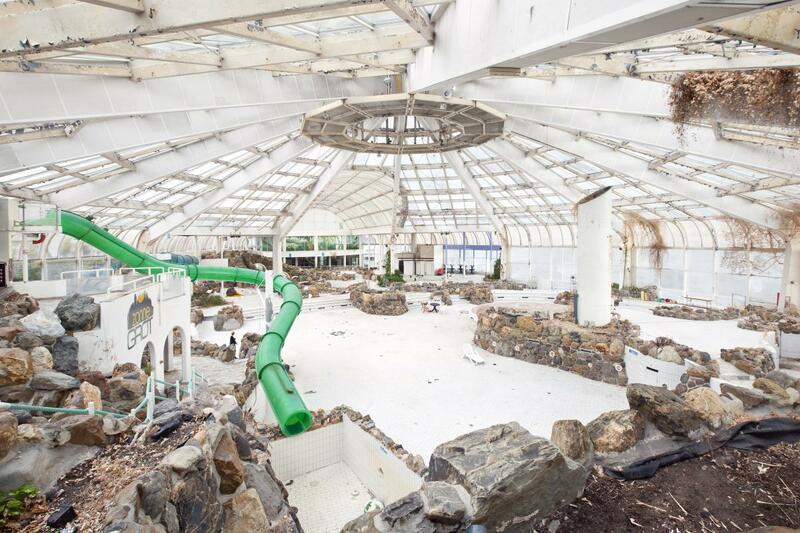 Rotterdam’s Tropicana water park, once full of lush vegetation, heated whirlpools and happy families, now stands empty and abandoned. Humans deemed it too difficult to repurpose, but nature is not so easily frustrated. Even here in the middle of the city, it provides ways to foster new life amidst ruin and decay. The mushroom, for example. ‘It kind of looks like a giant greenhouse,’ thought Siemen Cox one day when he drove past the glass dome of the abandoned Tropicana water park that sits in the centre of Rotterdam on the edge of the River Maas. When he got home, he picked up the phone and called the organisation that was keeping an eye on the place. ‘I have a proposal,’ Cox said. Meant to be a subtropical swimming paradise, Tropicana was built in the 1980s to accommodate people looking for a one-day spa and swimming experience, but the novelty quickly wore off, and a steady decline turned into bankruptcy in 2012. The building, with its tiled floors, empty pools, and faux-rock-formation walls, was a difficult if not impossible candidate for re-development. When Cox entered it for the first time, it had stood abandoned for only two years, but already it resembled the stuff of post-apocalyptic movies with weeds growing from the rusty ceiling and dead pigeons at the bottom of the empty Jacuzzis. Cox quickly realised that it was Tropicana’s basement that would best suit his needs. That same week, he got the key to the building and started growing edible mushrooms in the darkness below. Sign up to our infrequent mailing to get more stories directly to your mailbox. From the light-filled glass dome, visitors descend through pink-lined hallways that used to house beauticians’ offices, into the bowels of Tropicana, where the machinery that kept the whirlpools churning now sits silent. 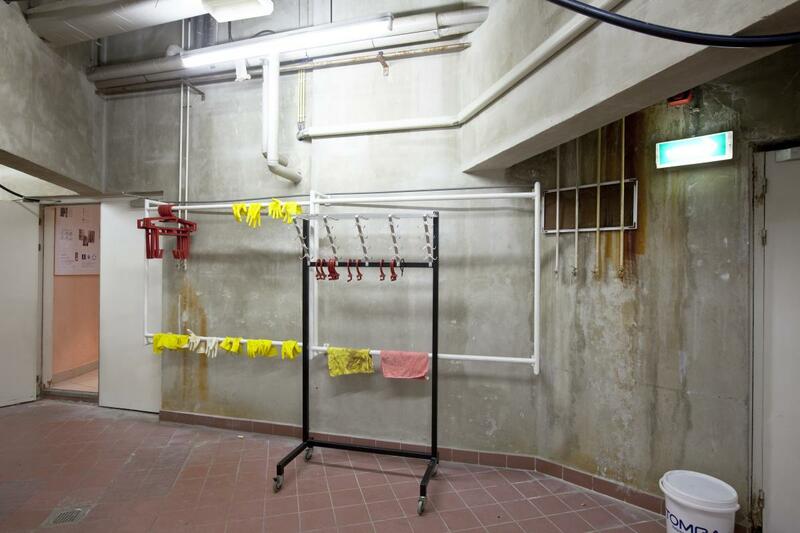 Cox has repurposed what material was left behind after Tropicana’s demise: clothes racks now serve to dry his work gloves, and hundreds of brown clothes hangers have been cut down to hold something else entirely. In a former changing room, rows of oyster mushrooms hang suspended from former clothing racks. They grow on oblong sacks filled with a soil of pasteurised straw and coffee collected from local espresso bars. Hanging in the warm, dark, moist room, the sacks resemble giant salamis. Up close, the lightly salmon-coloured oyster mushrooms appear too delicate to touch as they sprout from the soil in stacked clusters. But Cox has developed a knack for harvesting the mushrooms from the rolls delicately but resolutely with one quick twist. Marleen Sleeuwits is a photographer based in The Hague who researches what she calls ‘sick buildings’. Anne Miltenburg wrote the story of their visit to Tropicana. This article comes from Works That Work magazine, No.3.